Just say NO to any C21 sequel of Babri the horror movie. The powers that be are of the opinion that beating up on minorities will help win elections. This is from the Gujarat playbook but the success there was more out of a sense of Gujarati asmita than Hindu pride. Already there is evidence (recent by-polls in Uttarkhand, Bihar, and Karnataka) that a backlash is taking shape. Finally, people who live by the sword must be prepared to die by the sword as well...a number of ruling party leaders/workers in UP have been murdered in the past few weeks. As far as the Valmikis (Dalits) are concerned, the important question is how they survive in difficult conditions not their status as Hindus or Christians or Muslims. Religious status is not helpful for improving social status....otherwise there would be no need for separate Dalit Christian burial grounds and Dalit Muslim Mosques. Religious conversion is a dangerous game and we are ambivalent about the ways to deal with this "problem." A true liberal will be for the freedom to convert (and re-convert). Also if we were truly disadvantaged we would be happy to take money from all of them buggers and adopt a new religion every week (that will teach them). As an aside, we would love to hear Prof. Kancha I-laiah defending pork eating as a millenium old Dalit tradition and his plans to support the cause of the pig-farmers - the Valmiki community - by launching a national pork festival (just like the beef festivals he supports with so much enthusiasm). Fearing an outbreak of violence, the district administration locked the room on Thursday. The Shiva poster, which was put up in the place where a framed-photograph of Jesus Christ used to hang, has been taken off “and kept in a safe place.” The belongings of the church – a cupboard, Christmas-lights and a single copy of the Bible – has also been kept in a locker. Father Dominic Emmanuel, community leader and the editor of a Christian magazine in Delhi said, “With the BJP in power, these groups have become aggressive.” The village pradhan also pointed out that the BJP, for the first time, had received an overwhelming majority of the votes in the village. “Usually, the votes go for RLD. This time the elections was about Hindus and Muslims and every one voted for Modi. That has been reflected here,” said Vikas Choudhury, pradhan of Asroi. When the demolition of the Babri Masjid was threatened in 1991, Parliament en acted a law prohibiting the conversion of any place of worship of one religion into that of another, the only exception being the Babri Masjid itself. Back then, the Vishwa Hindu Parishad sought to demolish 3,000 mosques, claiming these were once temples. This threatened 3,000 more clashes of the Babri Masjid variety, stoking communal carnage and destroying Indian secularism. The Masjid was ultimately demolished, but the new law helped prevent the disease spreading to other places of worship. Now, our Constitution and laws clearly permit the conversion and re-conversion of individuals from and to any religion. The use of financial and other inducements for conversion is illegal, but voluntary conversion is permitted freely. The Seventh Day Adventists and the DJV both have a right to convert people to their respective faiths. The RSS claims that foreign Christian money is being used to “buy” converts to Christianity. This has certainly happened in some countries, leading to the derisive term “rice Christians”. But the Christians point out that overseas Hindus pour enormous sums into Indian religious organizations. Besides, Indian temples and organizations have humungous wealth. If indeed faith can be bought, Hindu organizations have a distinct financial advantage in India, and can easily outbid Christian ones. What is clearly illegal, however, is the destruction of a place of worship, or its conversion into a place of worship for another sect or religion. 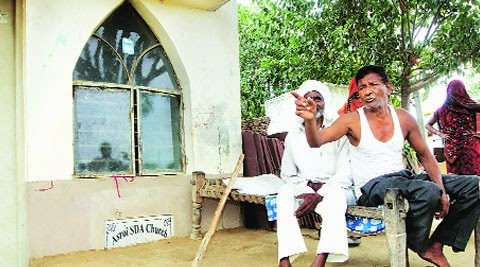 The 72 dalits in Aligarh can follow any religion they want, but cannot claim ownership of the church, which belongs to the Seventh Day Adventists. The mere fact that the 72 dalits worshipped in that church does not make it their personal property, to be disposed of as they like. They can build a temple on any other land, close or far from the church. But they cannot claim, as DJV leader Khem Chandra has done, that the church building may belong to the Christians, but the ground underneath belongs to Hindustan.